Shares in Google parent firm Alphabet have fallen almost 3% after the European Commission imposed a record 2.42bn-euro ($2.7bn; £2.1bn) fine on the tech giant. A sell-off in technology shares continued on the Nasdaq, which dropped over 100 points to 6,146.62. 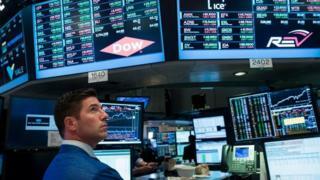 The Dow Jones Industrial Average fell 98.89 points to 21,310.66. The S&P 500 lost 19.69 points, or 0.8%, to 2,419.38. The drop marked the S&P's worst fall for almost six weeks, with the index closing at its lowest point since the end of May. Analysts said investors were rattled by the US Senate's decision to delay a vote on their healthcare bill until after next week's 4 July holiday. The suggestion that Republicans' Obamacare replacement plan may take much longer than expected, means that President Trump's other plans which include tax cuts, infrastructure spending and deregulation are also likely to be delayed.